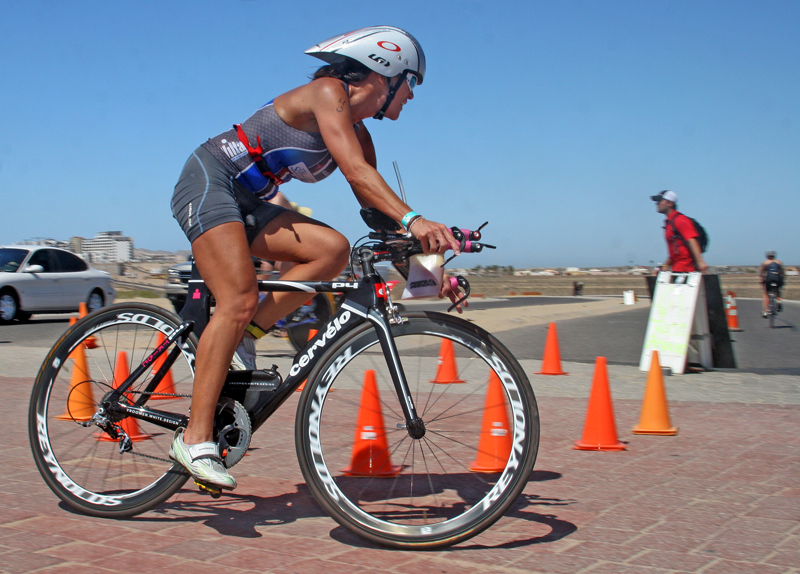 2012 Red Rock Las Palomas/Rocky Point Triathlon, Puerto Penasco, Mexico. 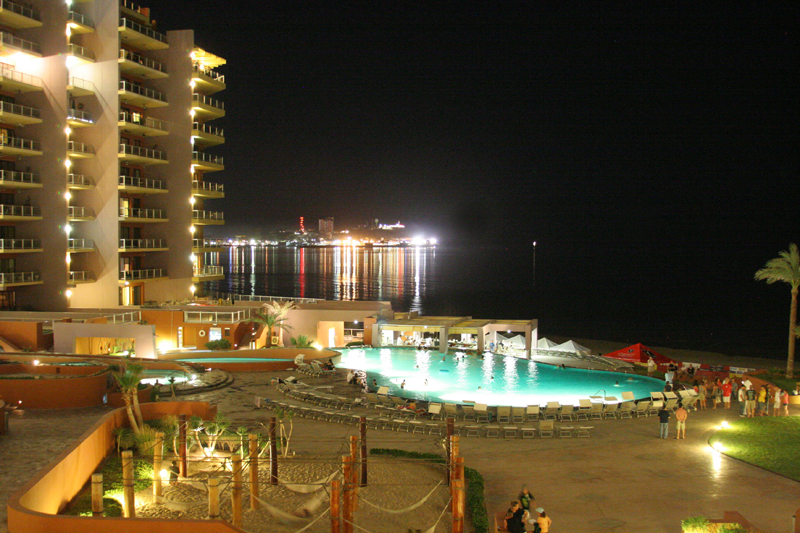 Puerto Penasco is a sleepy coastal town at the northern edge of the Sea of Cortez in Mexico. The warm, placid waters are havens for whale calving and dolphins. 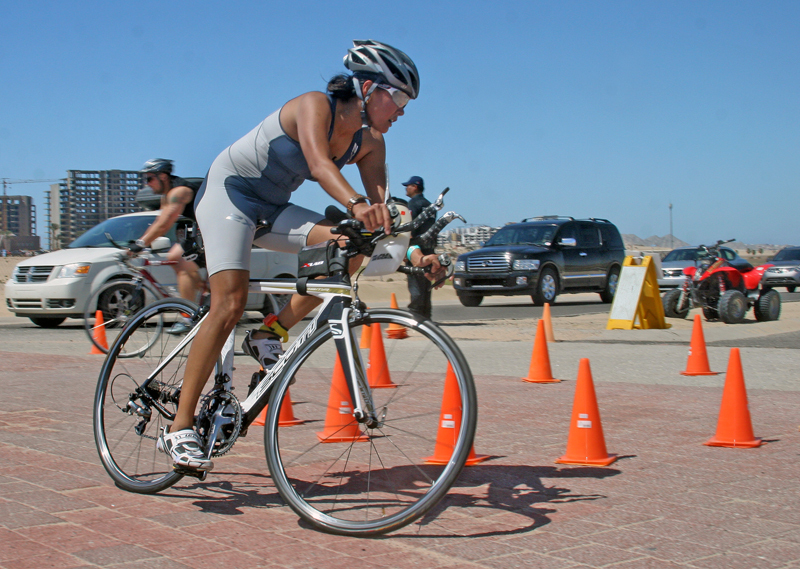 Once a year the city of Puerto Penasco, known in the U.S. as “Rocky Point”, hosts the Red Rock Las Palomas Triathlon at the Las Palomas Resort in Rocky Point. 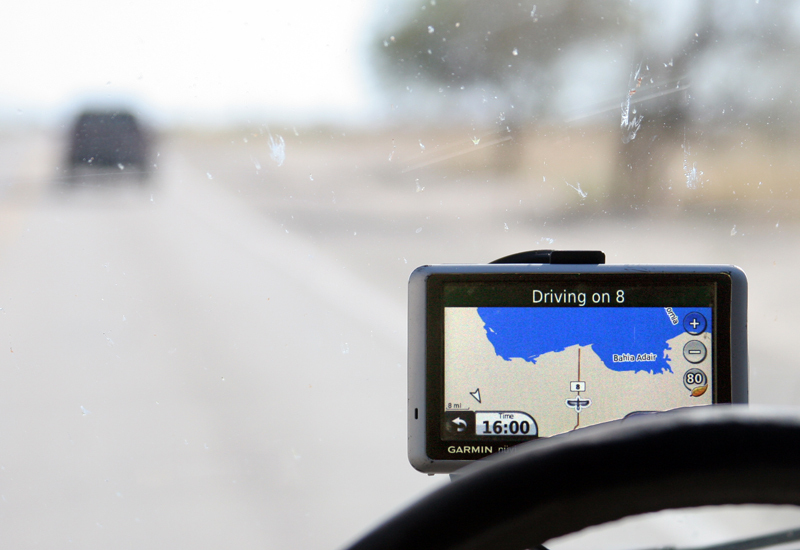 Here is our first sighting of the Sea of Cortez on our GPS as we make the scenic drive south through Mexico to Puerto Penasco. 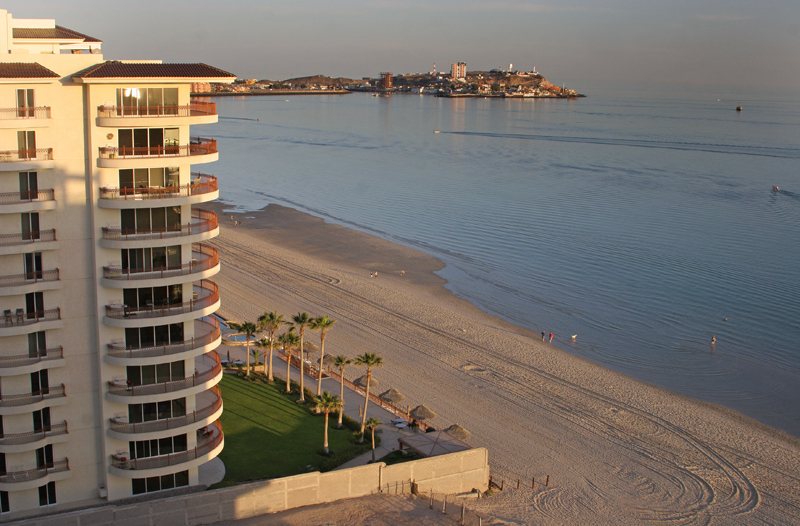 The beach at Puerto Penasco is idyllic light sand extending out into calm, shallow water. It is perfect for first time open water swimmers since it’s calm and shallow with good visibility the entire way out. 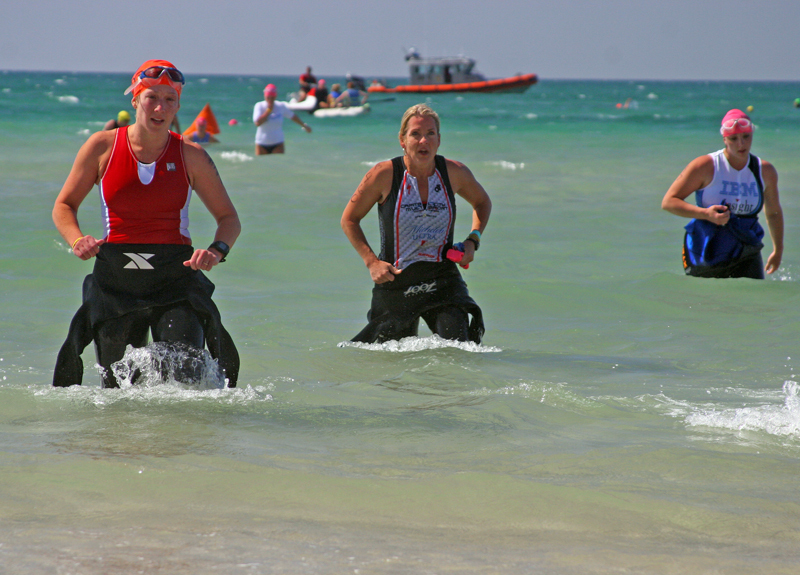 Shallow depths allow athletes to stand up almost everywhere along the 1000 meter swim course. Part of our group conducts a beach reconnaissance before the race. They discover swim conditions are excellent with no currents, comfortable water temperatures and a calm surface. 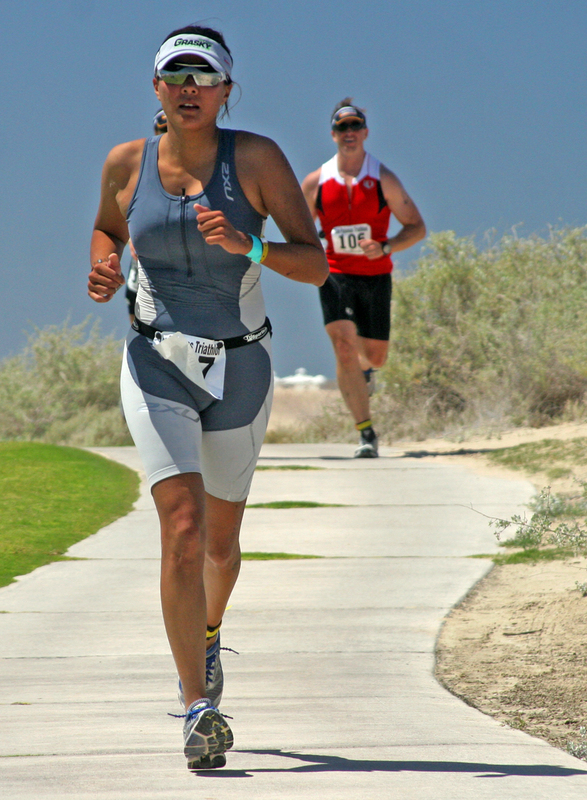 Many of the athletes at the Red Rock Las Palomas/Rocky Point Triathlon are first timers attracted to the perfect swim conditions and beautiful resort in a safe coastal town. This course suits them perfectly. 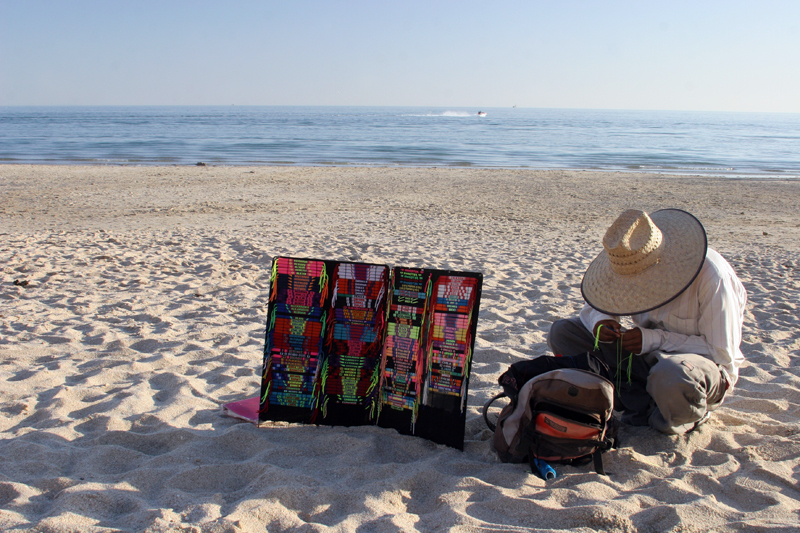 The sleepy beach community is safe for tourists with excellent local police and security. Crime in Las Palomas is actually lower than in Phoenix, Arizona. Many U.S. citizens own vacation property and retirement homes in the quiet little city known for its excellent local restaurants and colorful markets. Law enforcement in the area are helpful and friendly, anxious to spread the word about how pleasant and safe Puerto Penasco really is. 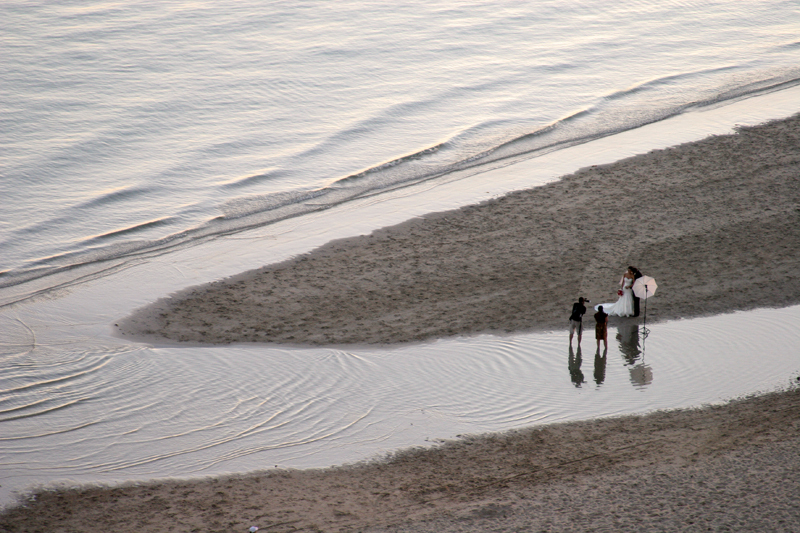 The storybook setting is an ideal destination for beach weddings like this one, just make sure the incoming tide doesn’t strand the bride and groom on a sand bar! 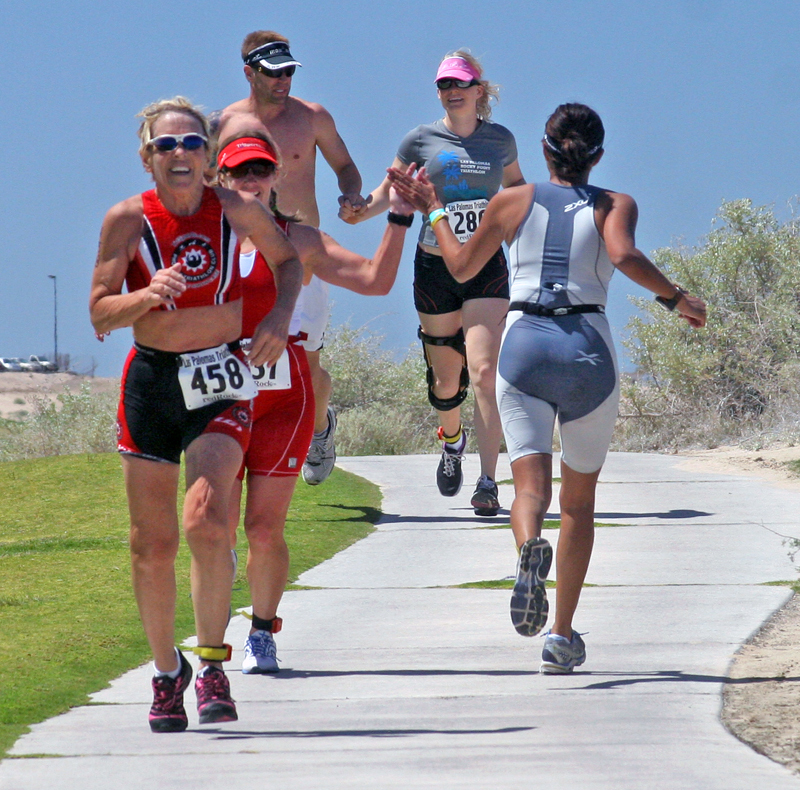 Athletes from Arizona, Texas, California, New Mexico and as far away as Idaho and Ohio made the trip to the Rocky Point Triathlon. Despite the perfect setting, great accomodations and excellent course only 134 athletes completed the Olympic distance triathlon with another 188 finishers in the results for the sprint distance event. Red Rock also hosted a nice 5K and 10K run during the event for non-triathletes. The event is clearly a “best kept secret”. 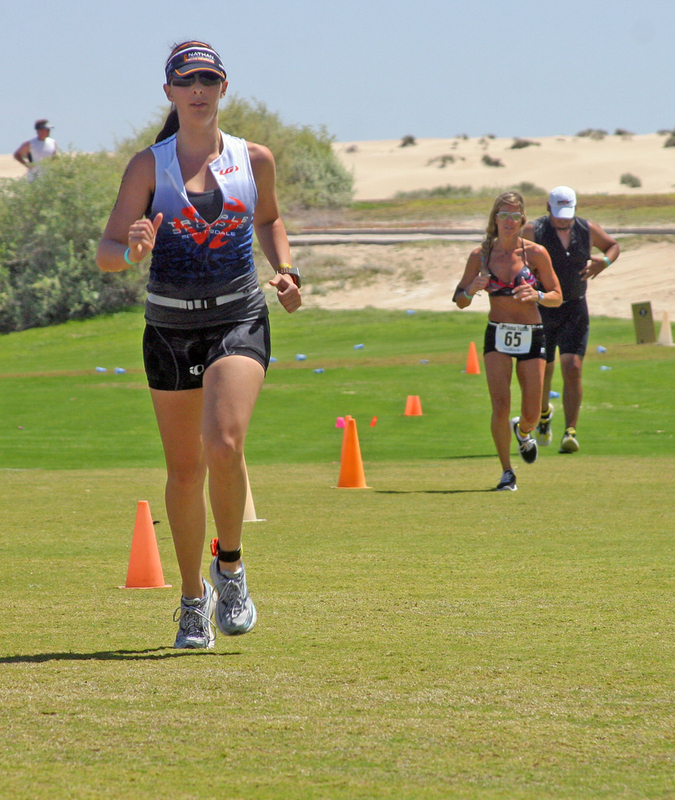 The Las Palomas Beach and Golf Resort hosts the Red Rock Las Palomas/Rocky Point Triathlon. 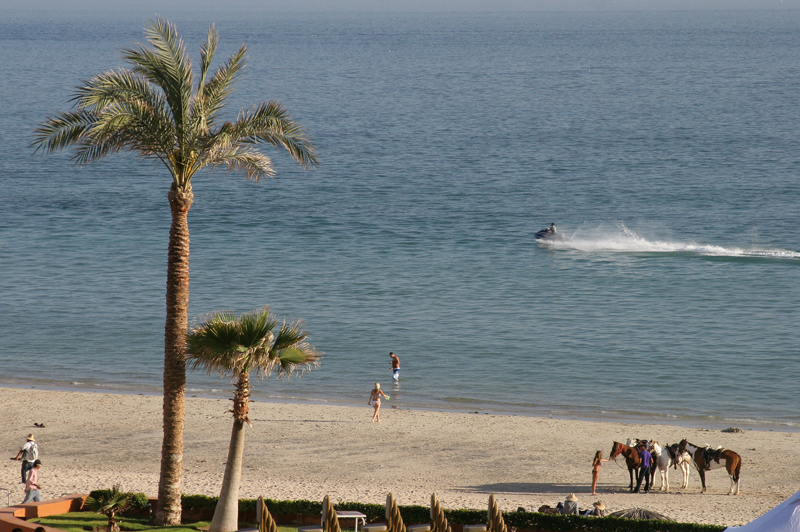 The resort features incredible views of the ocean and spectacular balconies worthy of any exotic coast around the world. It is a spectacular host hotel for the event. 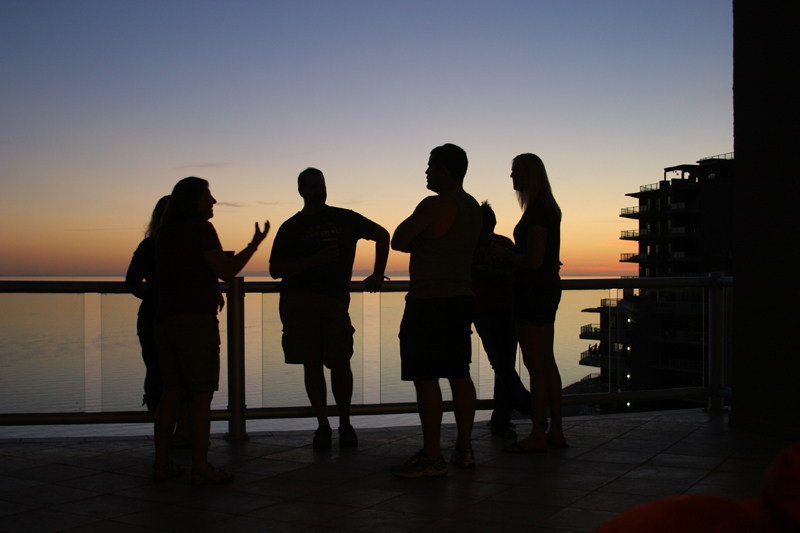 Our entourage discusses the swim course and conditions on the balcony the night before the race during another picturesque sunset on the Sea of Cortez. 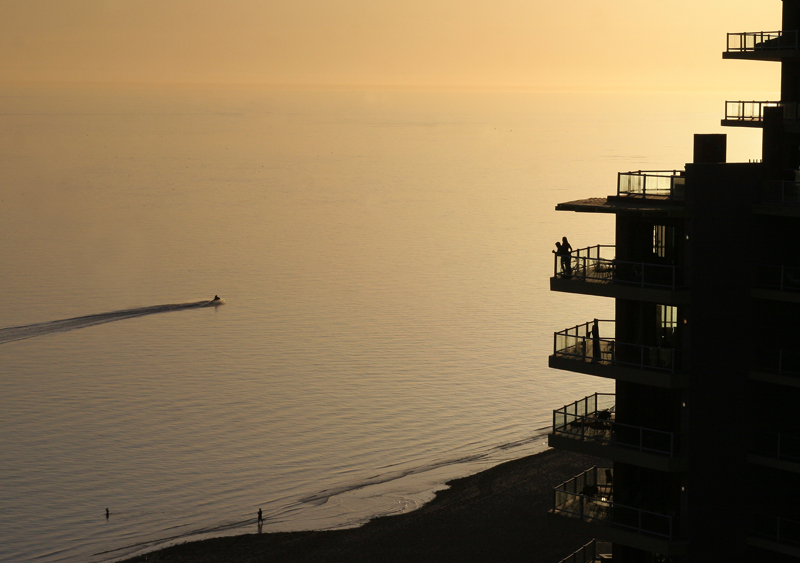 Athletes on balconies watch for feeding dolphins the night before the event as jet skiers return their craft before sunset. The golden light of the northern coast of the Sea of Cortez is spectacular in the evening. The pool area is quiet the night before race day as a few lingering athletes get race briefings and pick up their packets. The heated pools and hot tubs are popular for warming up after a night swim in the ocean. Crews from the Red Rock Company, event producers for the Las Palomas/Rocky Point Triathlon, use jet skis to pull swim buoys out onto the course on race morning. 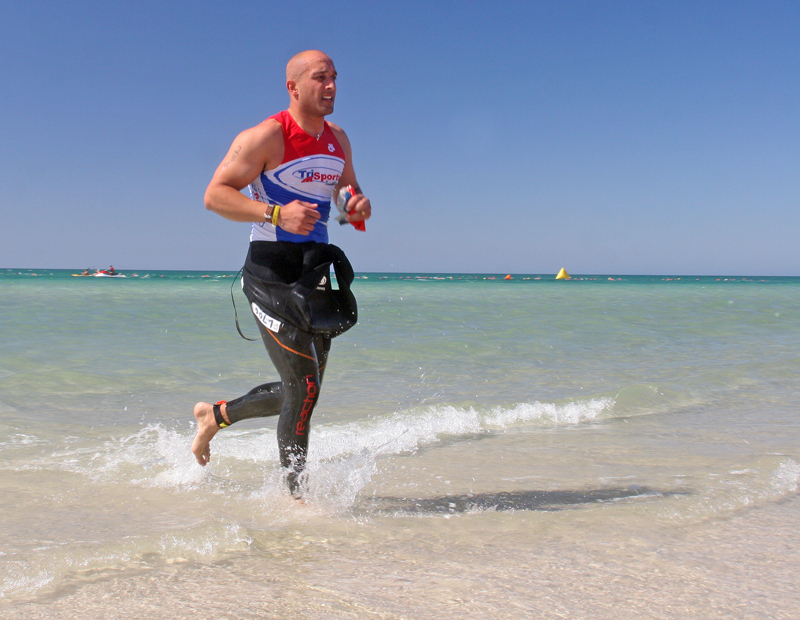 The course marking is excellent making the event a great first time open water swim experience. 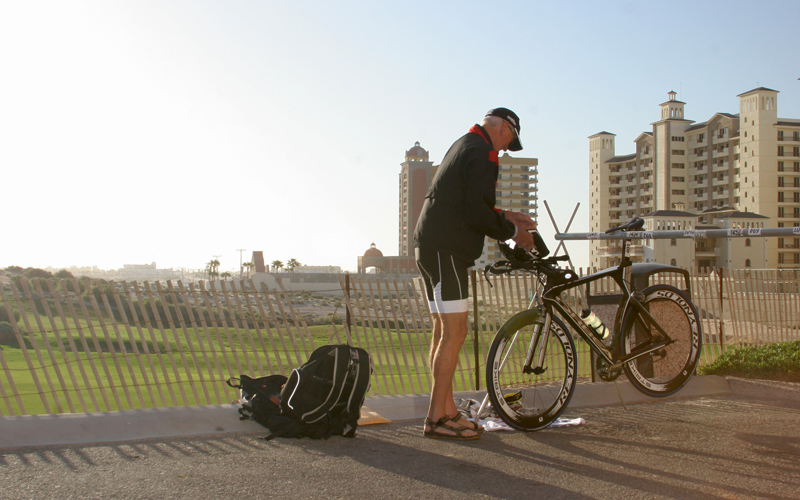 An early athlete sets up his transition area next to the hotel at the top of the beach. 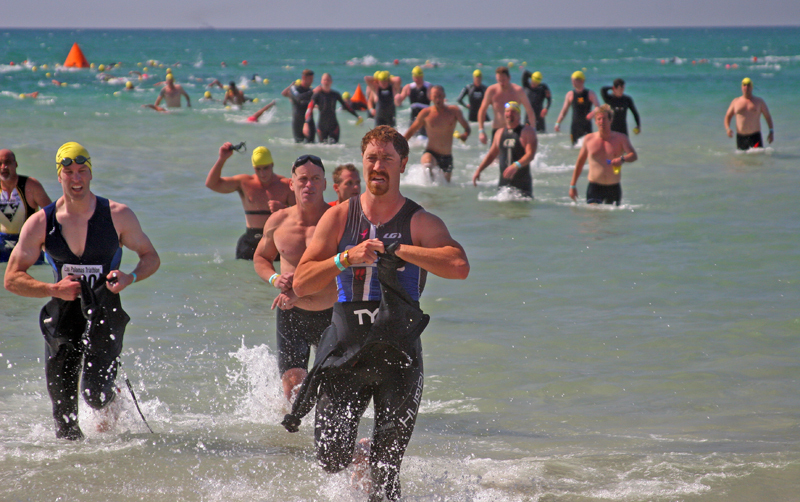 There is a short run up a sand berm to the first transition after the swim finish. The run uses the golf course across from the transition area. It’s a scenic, sunny but rolling and exposed venue that can be challenging. 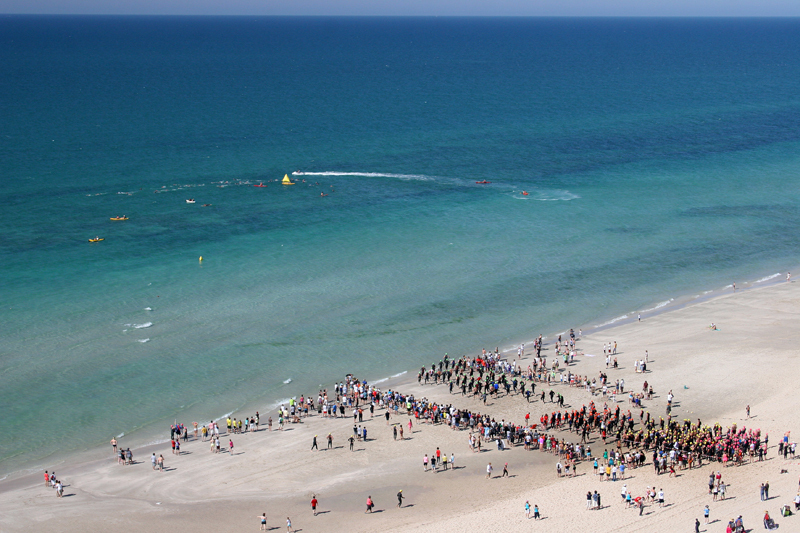 If you designed the perfect triathlon swim venue, this would be it: A shallow beach with firm sand, clear, warm water, calm conditions and excellent course marking with plenty of lifeguards. Course sighting was easy in clear, calm waters. 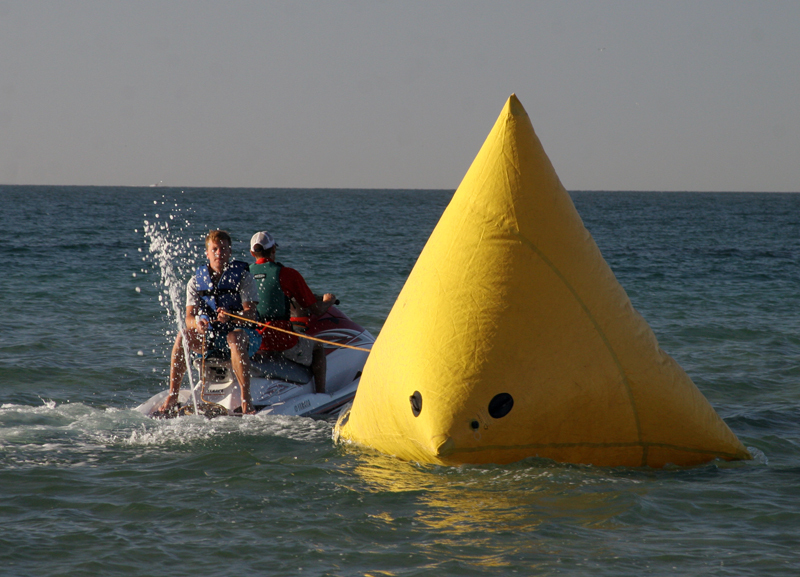 One of the first age category waves hits the swim course as the next wave waits for their start horn. Notice the athlete at the far right cutting the tangent to the fist buoy to save time and distance, a good strategy. 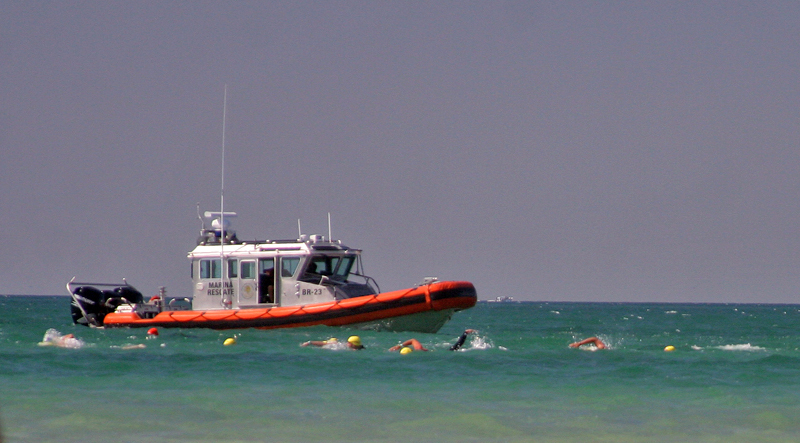 Mexican Coast Guard Units used rigid inflatable boats to patrol the swim course along with race volunteers and staff on jet skis, kayaks and paddle boards. Swim safety was excellent and the large, rectangular swim course meant crowding was not an issue. 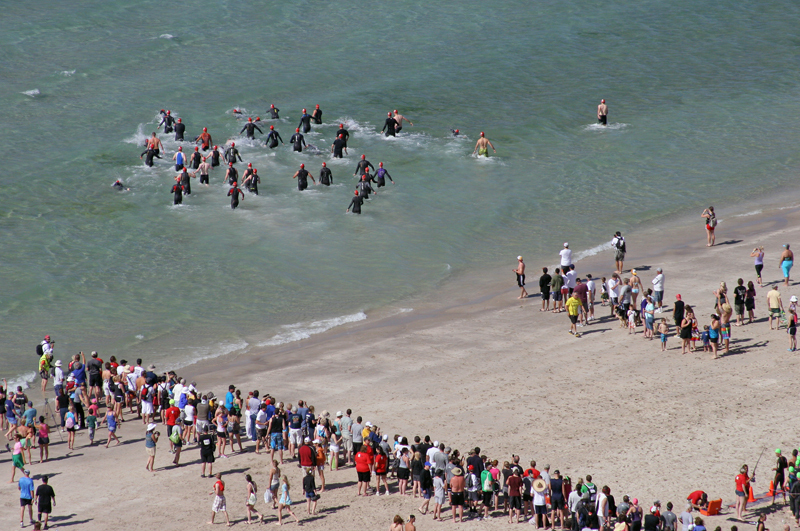 The swim “bubble” as wave starts converge near the swim finish where athletes stand in the shallow water to remove the top of their wetsuit in preparation for the run up the beach to T1. Terra McCreight (left) hits the beach with another group of athletes from her wave start. This was Terra’s first open water, ocean Olympic distance swim. Adam McCreight beaches after his wave arrives on shore. Adam and Terra organized a large group of athletes to travel from Tucson to Rocky Point for the Red Rock Rocky Point Triathlon. The Olympic distance athletes did three laps of an out and back bike course with sprint distance athletes doing two. Winds picked up late in the day challenging athletes who were on the course late. Here an athlete negotiates the turnaround before heading back out on her second of three loops. Dr. Cheri Ong, a surgeon originally from Kuala Lumpur, Malaysia now living in Tucson, Arizona, negotiates the turnaround to head out for another loop of the bike course as the winds gather. The open expanse of the Sonora Desert butts right into the north coast of the Sea of Cortez making for a barren bike course exposed to wind and heat. It is challenging but the multi-loop format makes the distance more digestible. One of the race leaders storms into the second transition after completing three loops of the bike course for the Olympic distance, 24.8 mile ride. 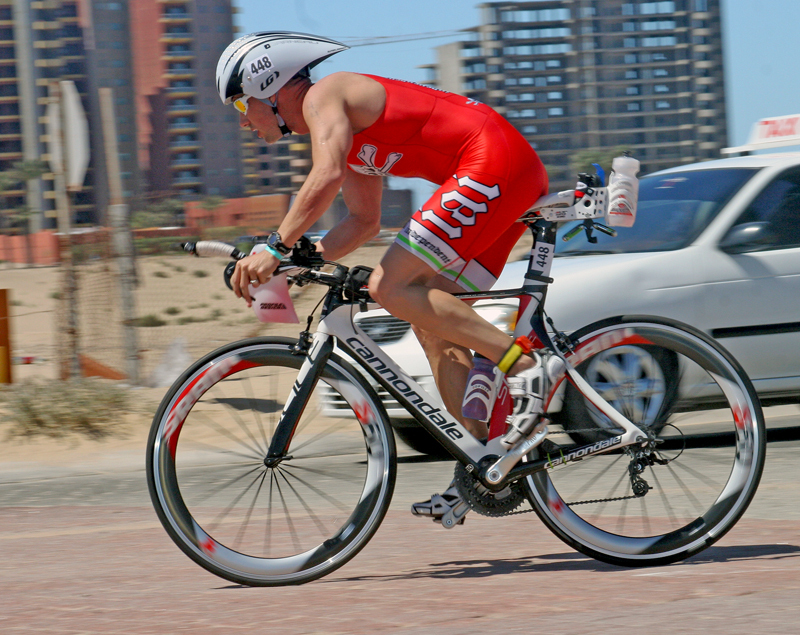 Athletes who got out of the water and off the bike course early had less wind to contend with. Terra McCreight begins her third lap under rising winds. McCreight’s preparation for the race season was interrupted by a serious auto accident that she recovered from quickly to return to training. Cheri Ong attacks the run. This was a pivotal race for Ong as she began to plan a number of events throughout the season. 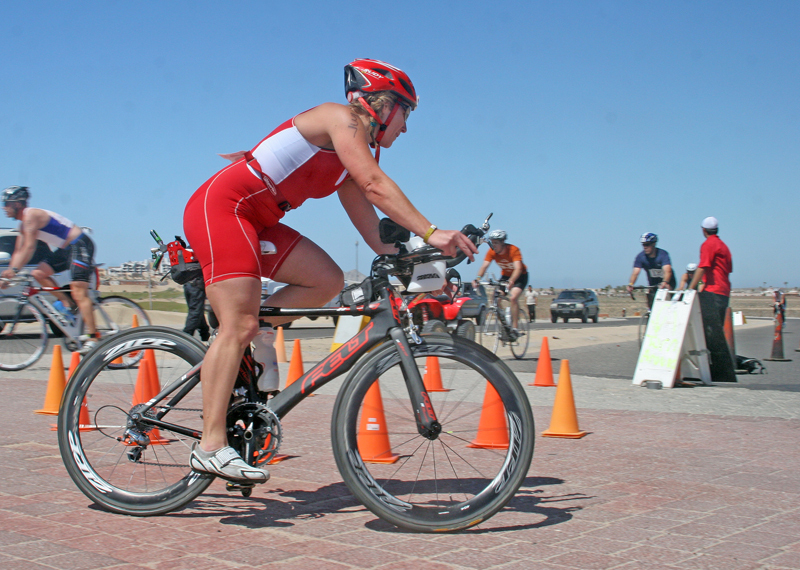 The surgeon balances the demands of a difficult profession against the training required for events like the Rocky Point Triathlon. Terra McCreight and Cheri Ong exchange a high five as they pass on the run course late in the Olympic distance race. Adam McCreight on the run. The rolling hills in the golf course took their toll on legs tired from battling the rising winds on the bike. A tunnel for golf carts gave runners respite from the sun on the Olympic run course as they went to the bottom of the course for the run turnaround. 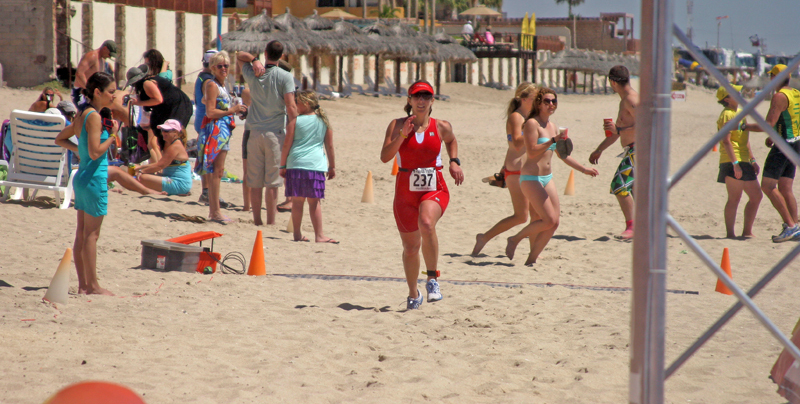 Water and sand were the theme of the entire course at Las Palomas. 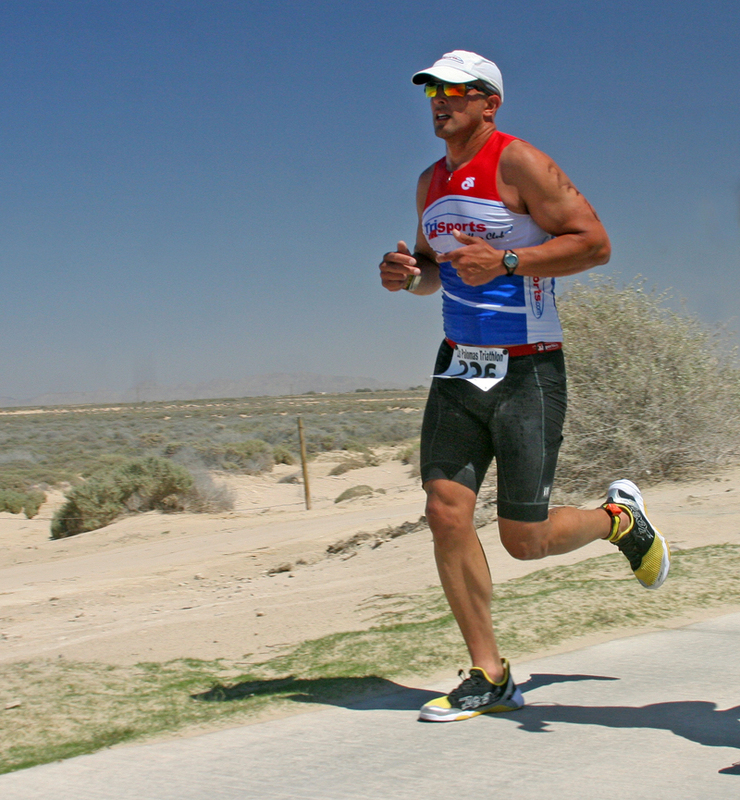 Nearly half the field at the Red Rock Las Palomas/Rocky Point Triathlon was doing their first triathlon here. It is a perfect event for first timers. Crossing the golf course athletes got a moment of respite from the heat on the cool grass. This section headed to the top of the course where they turned left to finish the outer loop of the run. Athletes had frequent opportunities to see each other on the course with the multiple out and backs. Terra McCreight covers the final few meters on the beach finish. The loose sand feels like wet cement on tired legs after the tough run of the Olympic distance event but the slip n’ slide at the finish makes it worth the effort. 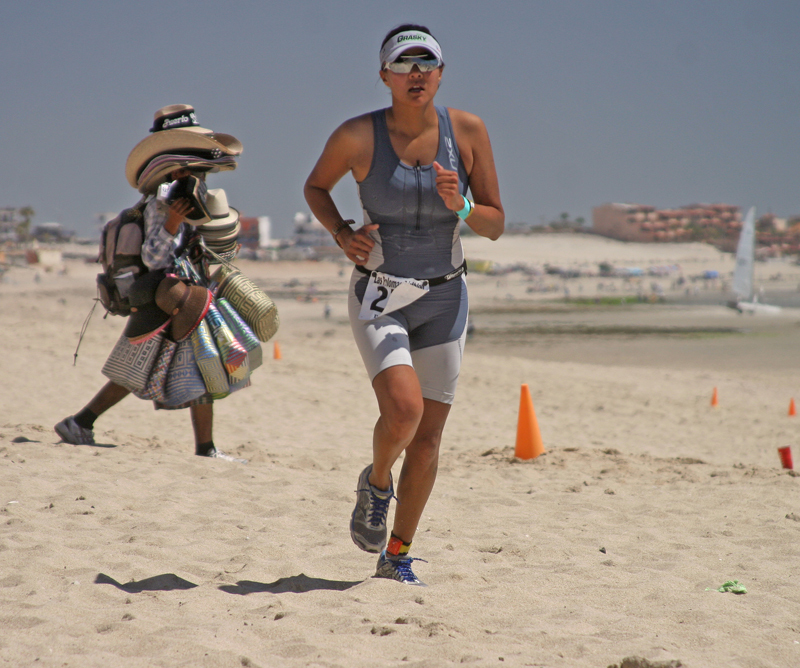 Cheri Ong of Tucson makes the final trip across the beach to the finish in the Olympic distance event. 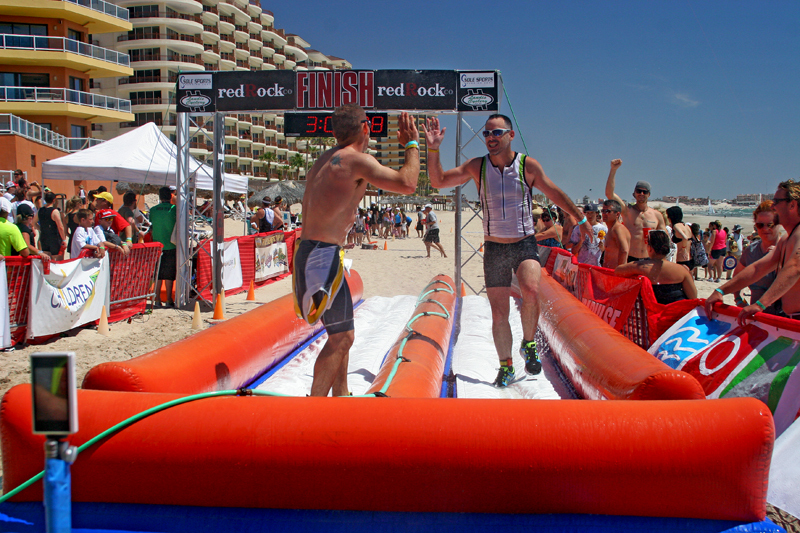 The Slip n’ Slide in the finish chute was popular after the warm conditions on the exposed run course. 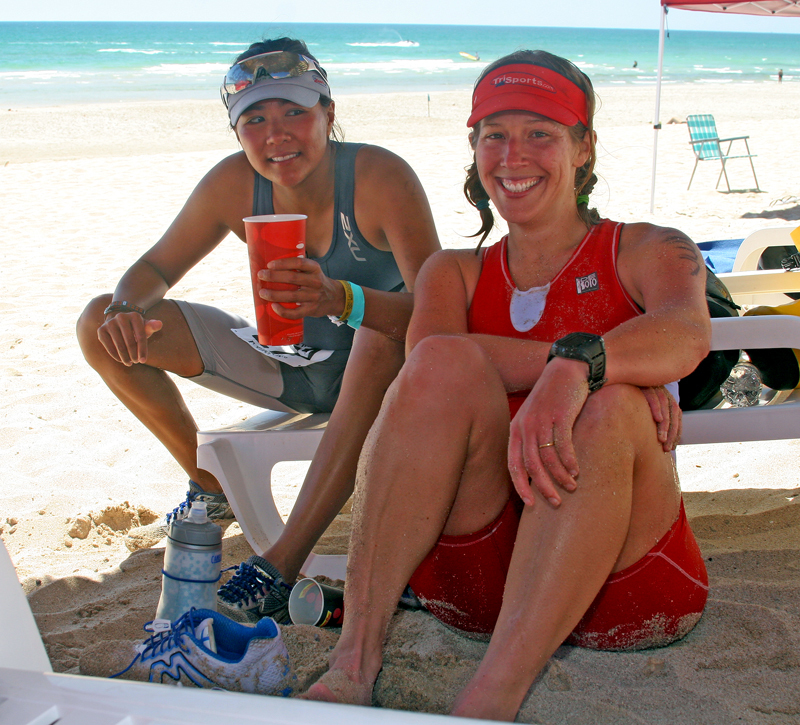 Cheri Ong and Terra McCreight enjoy the beach after finishing the Red Rock Las Palomas/Rocky Point Triathlon. The less PC attitude south of the border was apparent in the Tecate Beer tent as the Tecate girls were always ready to pose for fans. 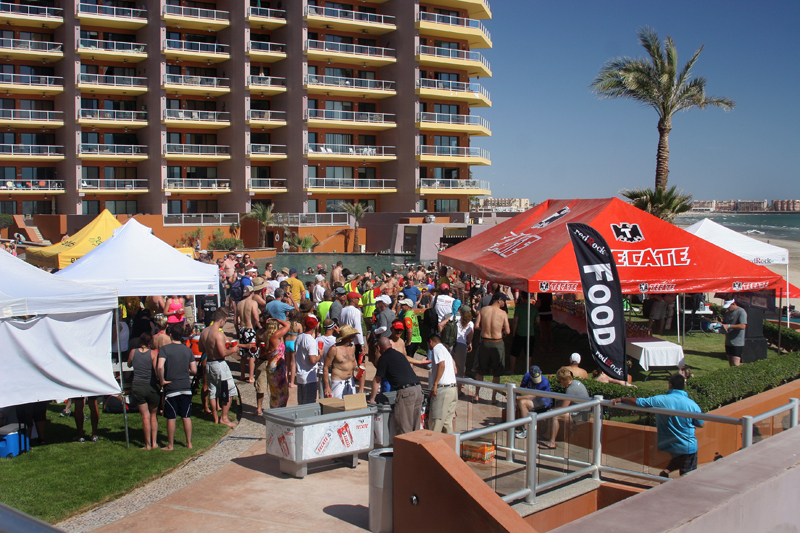 The Red Rock/Las Palomas Triathlon is the spring break of triathlons. With a festive award ceremony and a perfect party setting the event is poised to grow as the word spreads about the great race organization, excellent course and fantastic venue. The Red Rock crew deserves credit for a job very well done at Las Palomas.